Diagnostic medical sonographers and cardiovascular technologists and technicians, including vascular technologists, also called diagnostic imaging workers,operate special imaging equipment to create images or to conduct tests. The images and test results help physicians assess and diagnose medical conditions.Also helps doctors diagnose and monitor a variety of conditions such as heart disease, pregnancy and cancer. Healthcare professional with the appropriate training, who specialize in the use of ultrasonic imaging devices to produce diagnostic images, scans, videos, or 3D volumes of anatomy and diagnostic data. Sonographers have a high degree of responsibility in the diagnostic process. Many countries require that medical sonographers have professional certification. As a sonographer, you’ll work directly with patients. Most of your work is done at diagnostic imaging machines in dimly lit rooms, but you may also perform procedures at patients’ bedsides. Because imaging is sometimes needed in emergencies, sonographers sometimes work evenings, weekends or overnight. Diagnostic ultrasound uses high-frequency sound waves to produce images of the inside of the body. To do this, you’ll press an instrument called an ultrasound transducer to the parts of the patient’s body that are being examined. The transducer emits pulses of sound that bounce back, causing echoes. The echoes are then sent to the ultrasound machine, which processes and displays them as images. Necessary Education. 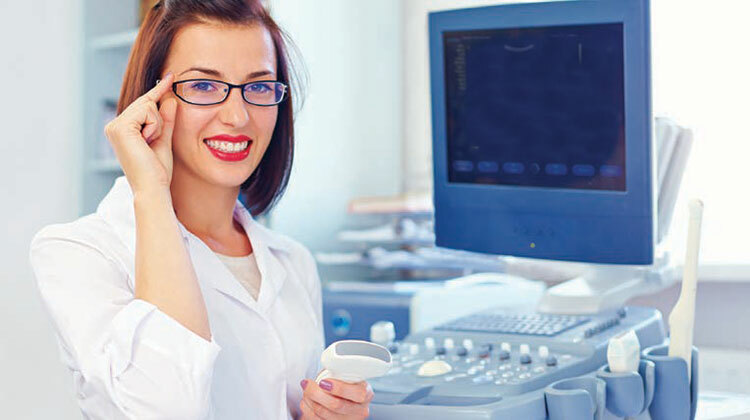 An associate or bachelor’s degree is typically required to pursue employment as a diagnostic medical sonographer. Students also have the option to graduate with a degree in a related field, pursue a certificate program in diagnostic medical sonography, and then receive on-the-job training. This is a career that challenges your expertise on a daily basis. The registry is national meaning you can find employment in any location. It also affords you the opportunity to grow within the field by acquiring certification in multiple specialties, thus allowing you to broaden your areas of expertise. Sonographers with multiple areas of specialties are highly sought after.